The last time we swung in we were in the area with our teenage son. This was the perfect time to dine at Everybuddy’s because their portions are wonderful – and filling up a 16 year old can be difficult. The restaurant is split into two areas, a restaurant dining room and the bar dining room. We sat in the restaurant section because the bar area was full. But, if you can, I recommend grabbing a seat on the bar side, especially during summer sun. The entire back wall is made of curving windows that overlook their deck and a yard area. The light and that feeling of being outside can really brighten up an afternoon. I have stopped in for a working lunch on more than a few occasions. Everybuddy’s is a local favorite. And here it is all about feeding hungry people in a friendly way. There is nothing fancy about the food, but everything tastes delicious and is well cooked. A lot of items are made in house, hand breaded, and not pre-frozen. I am a big fan of their chicken sandwiches – fried crispy, still juicy, and piled with veggies. On this dining occasion we decided to order a few different things from the menu. It was the first time I had tried any of their seafood options, and was fairly impressed. 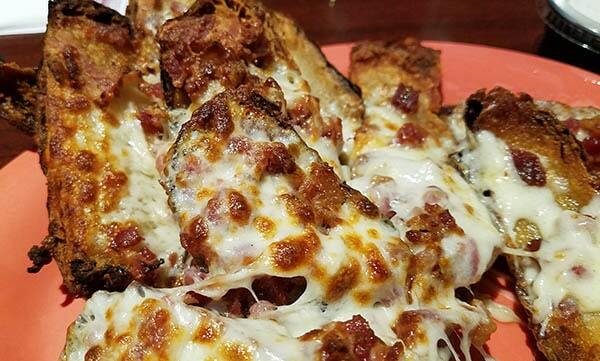 We started with potato skins. This appetizer came out as a platter covered in bubbling cheese and bacon crumbs. The skins themselves were nice and crisp – exactly as they should be. These looked like they were house made, still filled with plenty of potato, dusted with a little salt, and complete with a side of sour cream. This dish could have been a meal. I took it easy knowing we had more food coming. 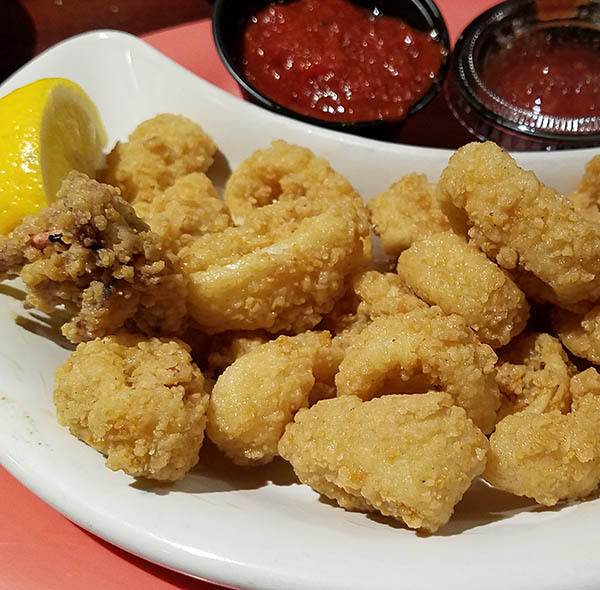 We also tried the calamari. Restaurants that are more casual, and more diner-like, often overcook fried seafood. That was not the case on this night. The portion size was decent, and my guys were happy that the pieces were mostly rings (I am the only one that likes the leggy bits). While there was nothing fancy or unique about the presentation or preparation, the calamari was tasty and well seasoned. For dinner, I ordered the fried seafood platter. It came with popcorn shrimp, clam strips, haddock, and scallops. This reached the table as a heaping plate of food. 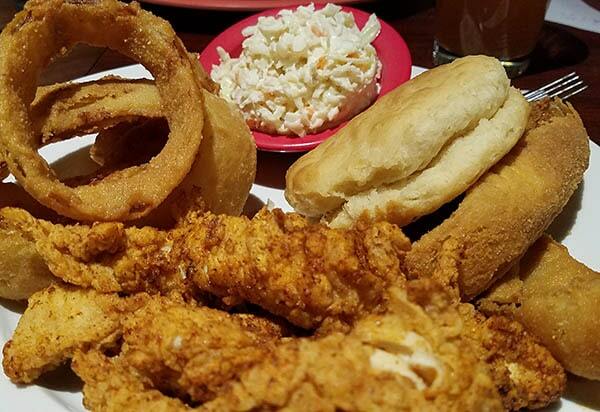 The dinner comes with 2 sides and a biscuit. I opted out of French Fries as there was plenty of fried seafood on the platter, and instead chose mashed potatoes, mac and cheese, and ordered a side salad bar. The platter of food was far more than I could eat, so my teenager graciously helped me out. Over all, the seafood was well done. It was an interesting mix of frozen and fresh protein, which is unusual on these platters and did create a noticeable difference in texture and flavor. 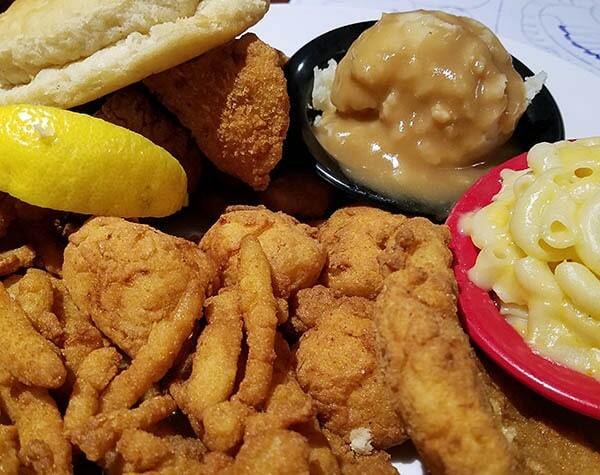 The popcorn shrimp and clams were exactly what you would expect from frozen fried seafood. I was happy to find that they were mostly meat though and not just breading as sometimes happens. But, the haddock and scallops were very fresh tasting, and if they had been previously frozen, I couldn’t tell. Both were succulent and full of flavor. 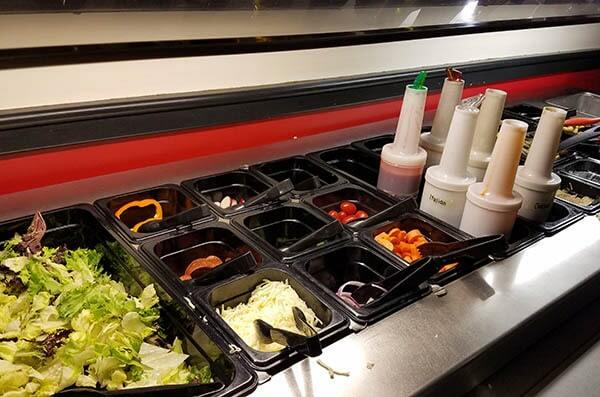 I was happy that this restaurant had a salad bar. I am a salad fan and love to be able to add my own combinations. Instead of plain romaine or a cheap salad mix, I was surprised to find plenty of leafy greens mixed in with romaine hearts. Onions, peppers, cheese, tomatoes, cucumbers, carrots, radishes, olives, fruits, cold salads and more, filled out the rest of the bar. My son, knowing he would be finishing our plates, ordered a poutine. This dish is on the appetizer menu, but you’d need a table (or a teenager) to eat all of it without being full. My son had a hard time finishing it after sampling from the other dishes on the table. I had to steal a few bites and found the fries to be crispy and the beef gravy had a good flavor. It wasn’t overly salty as is often the case in a premade gravy, and because they use mozzarella in place of curd, the cheese was fully melted. My husband ordered the fried chicken dinner. This came with four large pieces of boneless chicken breast, hand battered and deep fried. The batter was seasoned and very traditional. He went with the dry rubbed option, which was quite spicy but not over powering. He was really happy with the flavor and the heat level. This meal also came with two sides. He ordered onion rings, which were also hand battered and large, and coleslaw. T he buttermilk biscuits that came with the dinners were almost as big as saucers with a soft, crumbly texture and just a hint of sweetness. 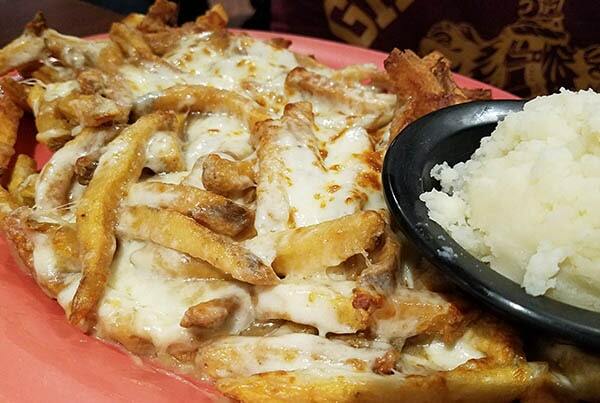 There is a list of sides to choose from, each dinner comes with two. The mashed potatoes weren’t bad. They had body, plenty of butter, and the gravy was a good thickness. The mac and cheese is a dish kids can appreciate. Instead of a traditional baked pasta, this dish is covered with a creamy cheese sauce that coats the pasta – perfect for picky eaters. Unlike most diners, Everybuddy’s Restaurant also has a full bar. We stuck with beer and wine on this night, but it is great to know of a casual bar where you can grab an after work cocktail. Overall the meal was good. We were very happy with the price and the amount of food you get for the money. Service was a little slow but the place was super busy, and our server was very sweet and helpful. Another thing that strikes me about this Lyndonville restaurant is there is a real sense of community. 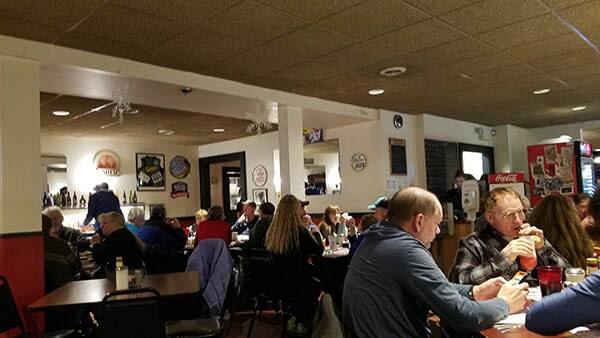 They have a loyalty program, run contests, and every time I eat here there are a number of people that know each other by name – staff and diners. If you are looking for a quick yet hearty meal, a place to bring the kids where they will enjoy the food, and an atmosphere that is relaxed – bring every buddy here.